System analyser, diagnostic and benchmarking. 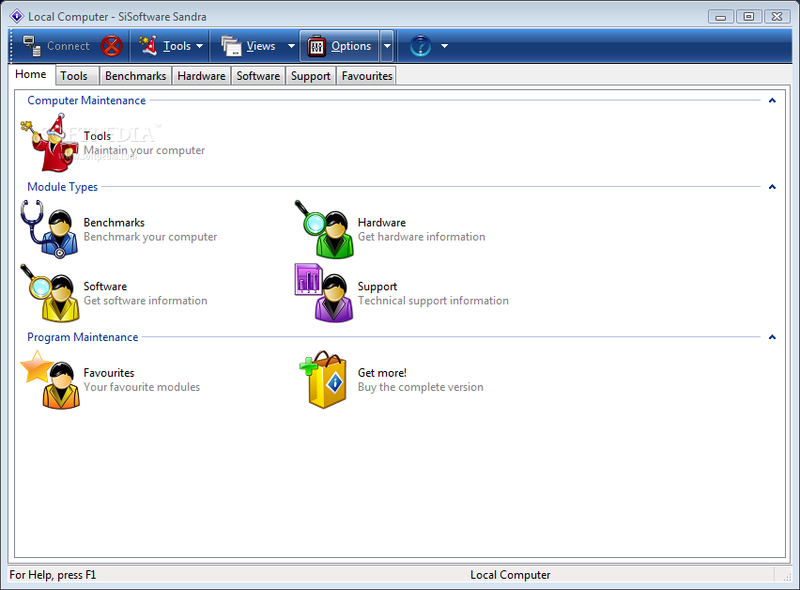 SiSoftware Sandra was designed to be a 32 and 64-bit Windows system analyser that includes benchmarking, testing and listing modules. It tries to go beyond other utilities to show you more of what is really going on under the hood so you draw comparisons at both a high and low-level in a single product. You can get information about the CPU, chipset, video adapter, ports, printers, sound card, memory, network, Windows internals, AGP, ODBC Connections, USB2, Firewire etc. You can save/print/fax/e-mail/post/upload or insert into ADO/ODBC databases reports in text, HTML, XML, SMS/DMI or RPT format. This version supports multiple sources of information gathering including: remote computers, PDAs, Smart Phones, ADO/ODBC databases or saved system reports. All benchmarks are optimised for both SMP & SMT (Hyper-Threading), up to 32/64 CPUs depending on the platform. Graphics (GPGPU) Processing: Benchmark the graphics performance of the graphics processors (GPGPUs). Such operations are used by specialised software, e.g. scientific software, image manipulation, video decoders/encoders, games that make GPU performance pretty important. Graphics (GPGPU) Bandwidth: Benchmark the bandwidth of the memory of the graphics processors (GPGPUs) and the bandwidth of the bus that connects them to your computer. The speed at which the data can be sent to the GPGPUs, internally processed and the results sent back is as important as the processing power of the GPGPUs. Video (GFX) Rendering: Benchmark the graphics performance of the video adapters (GFXs). Shows how your graphics processors handle rendering in comparison to other typical graphics processors. Such operations are used by all graphics software, image manipulation, video decoders/encoders, games and modern operating systems. Video (GFX) Memory: Benchmark the bandwidth of the memory of the video adapters (GFXs) and the bandwidth of the bus that connects them to your computer. Cryptographic Performance: Benchmark the cryptographic performance of modern processors that support hardware cryptographic engines. The most common algorithms, AES (AES128, AES256) for encryption/decryption and SHA (SHA1, SHA256) for hashing are supported. Supports the following Virtual Machines (VM) and Runtime Engines: – Java Runtime Engine (JRT) 1.6.x (x86/AMD64/EM64T) – .NET Framework 2.0, 3.0, 3.5 (x86/AMD64/EM64T/IA64) Supports the following GPGPU Engines: – AMD STREAM 1.0x (x86/AMD64/EM64T) – nVidia CUDA 2.0 (x86/AMD64/EM64T) NOTE: Free for private or educational use · 4 native architectures support (x86, x64/AMD64/EM64T, IA64/Itanium2, ARM). · 2 native GPGPU platforms support (AMD CTM/STREAM1, nVidia CUDA1, future Intel). · 3 native Graphics platforms support (DirectX 9, DirectX 10/10.1). · 23 established benchmarking modules, 4 new to this version. · Huge official hardware support through technology partners (Intel, AMD/ATI, SiS, VIA). · 7 charting options: combined, components, performance vs. speed/power/cost, capacity vs. power/cost charts. · 6 language versions (English, German, French, Italian, Russian, Chinese) in a single installer. · Enhanced Sandra Lite version (free for personal/educational use) Requirements: · DirectX 9c/10/10.1 redistributables (x86/AMD64/EM64T/IA64) · OpenGL 1.5 and later (x86/AMD64/EM64T/IA64) Limitations: · This version is shareware but free for private or educational use (see licence). Some modules are only available in the commercial versions. What’s New in This Release: · Includes many improvements in hardware support (monitoring) as well as support for new APIs in future operating systems.